In contrast to other fluorogenic caspase substrates or fluorescent caspase inhibitor based (FLICA) assays, NucView® caspase-3 substrates can be used to detect caspase-3/7 activity within individual intact cells without inhibiting apoptosis progression. NucView® substrates consist of a fluorogenic DNA dye coupled to the caspase-3/7 DEVD recognition sequence. 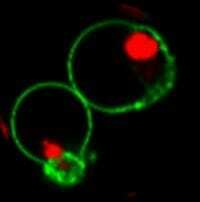 The substrate, which is initially non-fluorescent, penetrates the plasma membrane and enters the cytoplasm. In apoptotic cells, caspase-3/7 cleaves the substrate, releasing the high-affinity DNA dye, which migrates to the cell nucleus and stains DNA with fluorescence. Thus, NucView® Caspase-3 Substrates are bifunctional, allowing detection of caspase-3/7 activity and visualization of morphological changes in the nucleus during apoptosis. The staining is also formaldehyde-fixable. NucView® 530 Caspase-3 Substrate stains apoptotic cell nuclei with orange fluorescence (Ex/Em 528/563 nm, Figure 1), for detection in the Cy®3 channel by fluorescence microscopy (Figure 2) or the PE channel by flow cytometry (Figure 3). NucView® 530 can be used for multi-color imaging with blue, green, or far-red fluorescent probes. 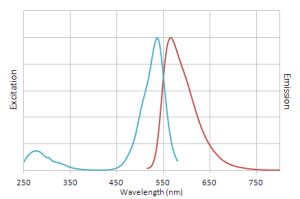 Note that when excited by the 488 nm laser line, NucView® 530 also fluoresces in the FITC channel, and therefore cannot be analyzed together with green probes by flow cytometry. NucView® 530 Caspase-3 Substrate is available as a 1 mM solution in DMSO (catalog no. 10406) or PBS (phosphate-buffered saline). 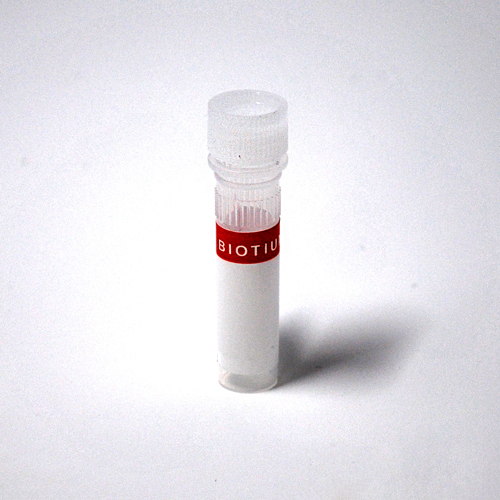 The substrate in PBS is formulated for use in cells that are sensitive to DMSO toxicity. In non-DMSO sensitive cell types, adding DMSO during the substrate incubation may enhance NucView® 530 staining. Biotium also offers blue fluorogenic NucView® 405 Caspase-3 Substrate, and green fluorogenic NucView® 488 Caspase-3 Substrate and kits. Figure 1. 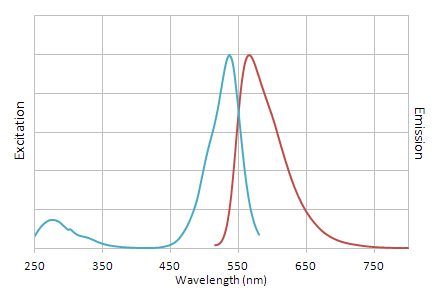 Excitation and emission spectra of NucView® 530 dye with dsDNA. Figure 2. Detection of mitochondrial membrane potential, caspase activity, and apoptosis in MCF-7 cells. Cells were either untreated (A) or treated with staurosporine overnight to induce apoptosis (B), then stained with MitoView™ Blue, NucView® 530 Caspase-3 Substrate, and CF®488A Annexin V for 30 minutes at 37oC in cell culture medium with no wash. Healthy cells show mitochondrial staining with MitoView Blue (cyan). 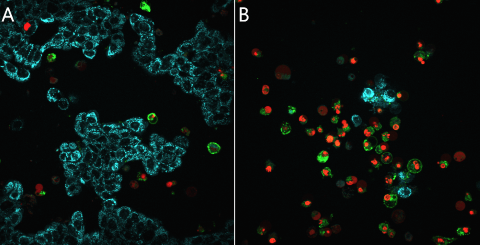 Apoptotic cells lose MitoView™ Blue staining (cyan), and show NucView® 520 staining of nuclei (red) and CF®488A Annexin V staining of cell membranes (green). Figure 3. Jurkat cells were treated with DMSO (negative control, blue) or 0.1 uM, 0.25 uM, or 1 uM staurosporine (red) to induce apoptosis in the presence of NucView® 530 and CF®405M Annexin V for four hours at 37oC before analysis on a BD LSR II flow cytometer. Staining with NucView® 530 and CF®405M Annexin V increase with increasing concentration of staurosporine. Cy dye is a registered trademark of GE Healthcare.